Ah, no worries, everyone. Don’t get overwhelmed or weirded out by that long salad recipe title! It’s PACKED with yummy goodness and if you’re the slightest bit skeptical about vegan recipes or wondering whether a salad can truly be a meal in itself…well, give this one a whirl and you’ll be convinced! 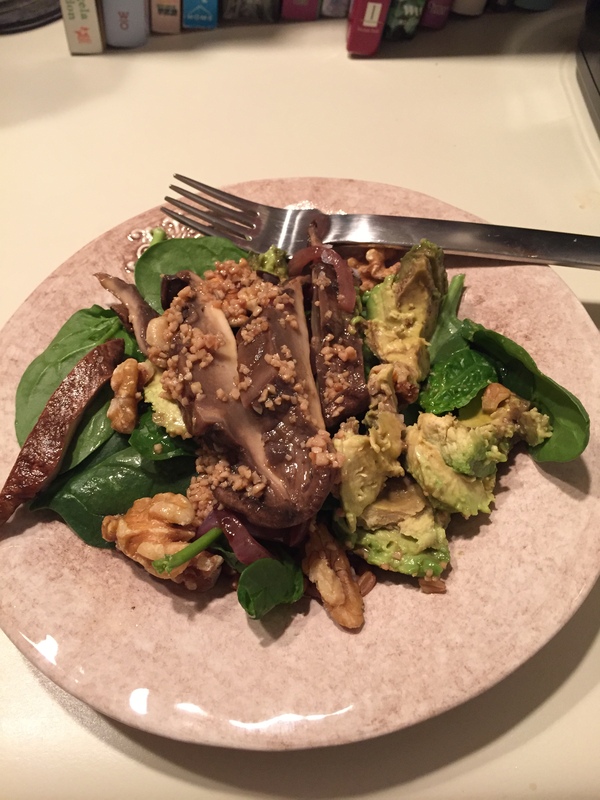 The mushrooms pack a good dose of protein, and the avocado provides healthy fats we all need (as do the walnuts). Add in some buttery pears, dark leafy greens (I prefer to serve this over a bed of spinach leaves) and a vinaigrette so easy to prepare and you’ve got a fabulous meal (or two, if you’re cooking for one as I typically do!). The mushroom and onion will keep in the marinade in a Tupperware in the fridge for a couple days. Gently rub the outside of the mushrooms with a damp towel to remove any debris. Remove the stems by twisting the stem until it pops off; discard it or freeze for another use, such as stir-fry. With a small spoon, scrape out and discard the black gills. In a large bowl, combine the mushroom caps, onion and half of the balsamic vinaigrette. Toss until fully coated. Marinate the mushrooms and onion for 20-30 minutes, tossing every 5-10 minutes. Heat a grill pan over medium-high heat. Place the mushroom caps and the onion on the pan and grill for 3-5 minutes per side, until grill marks appear and the vegetables are tender. Reduce the heat if necessary. Remove the pan from the heat and set aside until the mushroom caps are cool enough to handle, then slice the mushroom caps into long strips. For each salad, place a few handfuls of the mixed greens in a large bowl and top with half of the chopped pear, avocado, walnuts, and grilled mushrooms and onion. Drizzle the salad with some of the remaining vinaigrette and enjoy! This recipe is vegan, gluten-free, soy-free, refined sugar-free and grain-free.